Basically, what that means is that anytime something goes wrong—whether it’s a flat tire or something far more serious—pessimistic thinkers explain the stress like this: “This will be around forever, it will impact multiple areas of my life, and it’s all my fault.” In other words, they personalize it and see the fallout as being permanent and everywhere. Your explanations can range from optimistic to pessimistic and fall along a continuum. Seligman’s research has shown that consistent pessimistic explanations are associated with an increased likelihood of depression, anxiety, hopelessness, and helplessness. So the goal of thinking differently in resilience training is to push back against this type of pessimistic reasoning. 2. Connecting more. I learned a new term working with the soldiers: “battle buddy.” A battle buddy is another person a soldier can count on in any type of situation. Developing high-quality relationships is critical to living a happy, healthy, and resilient life because of the benefits they provide. 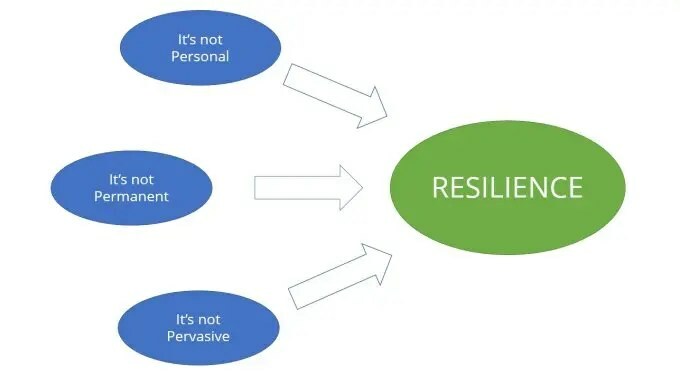 Resilience experts typically identify four: they’re empowering, they provide a sense of trust, they let you be your authentic self, and they’re built on respect. You’ve recovered when your work-related strains are reduced. That means that it’s often not enough just to go home and take a break. 3. Staying energized and motivated.Resilience demands incorporating recovery into your daily routine. “Recovery” is simply the process that brings your functioning back to pre-stressor levels. You’ve recovered when your work-related strains are reduced. That means that it’s often not enough just to go home and take a break. Optimal recovery is a combination of both internalrecovery—the short breaks you take while you’re at work—and external recovery, how you spend your time after work, on the weekends, and on vacation. Finally, staying energized and motivated also means being connected to a source of meaning. People who believe that their lives have meaning and purpose share a whole host of healthy benefits: They’re happier, feel more in control over their lives and more engaged at work, and they report less depression, anxiety, and workaholism.